Inventory We are a resale marketplace, not a box office or venue. Ticket prices may exceed face value. This site is not owned by Ryman Auditorium . The Ryman Auditorium is one of the most historic venues in the United States opening way back in 1892 as the Union Gospel Tabernacle. The Ryman Auditorium box office is located at 116 Fifth Avenue North in downtown Nashville, Tennessee. The venue underwent a major renovation in 1994 and has a current seating capacity of 2,362. 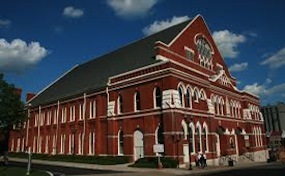 Ryman Auditorium is most well known for being home to the broadcasts of the Grand Ole Opry from 1943 to 1974. The venue has been voted the National Theatre of the year in 2003 and 2004 by Pollstar Magazine and has been rated the second best acoustics in the world. Ryman Auditorium Tickets have played host to legendary performers like Johnny Cash, Minnie Pearl, Bill Gaither, Neil Young, and even Coldplay. AuditoriumNashville.com is not currently affiliated with any primary box office, venue, or official website. We concentrate in selling tickets to all events in the secondary market. Ticket prices can fluctuate above or below face value and will change with demand. To purchase tickets to all Ryman Auditorium Nashville events simply navigate the steps online through the checkout or pick up the phone and call our operators at anytime.